Free Wordpress Theme – Brightsidefluid 10 | WordPress Theme | All Free Web Resources for Designer - Web Design Hot! Features Include: Custom Background, Sidebar, Text, Links,and Sidebar Border Colors, Automatically pull color palettes, Custom Background Image, Custom Logo, Custom Page Width, Left or Right Sidebar, Customize Sidebar Width, Rounded Corners in Firefox, Safari, and iPhone, Drop Down Menu Support, Facebook Connect Support, Threaded Comments, Gravatar Support, Microformats, Sticky-Post Class Support. 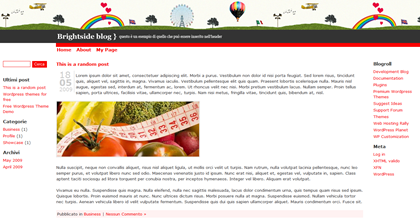 Widgetized Blog Header, Footer and Page Sidebar. This entry was posted on Thursday, September 10th, 2009 at 4:01 am and is filed under WordPress Theme . You can follow any responses to this entry through the RSS 2.0 feed. You can leave a response, or trackback from your own site.